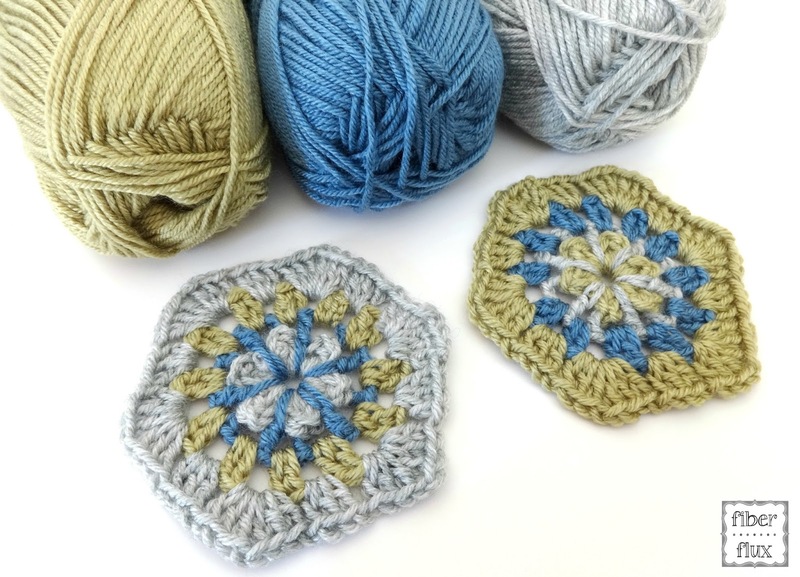 This Hexagon Motif Project Bag is a gorgeous way to take your projects with you...at the park, on the road, perhaps on a lunch break too. 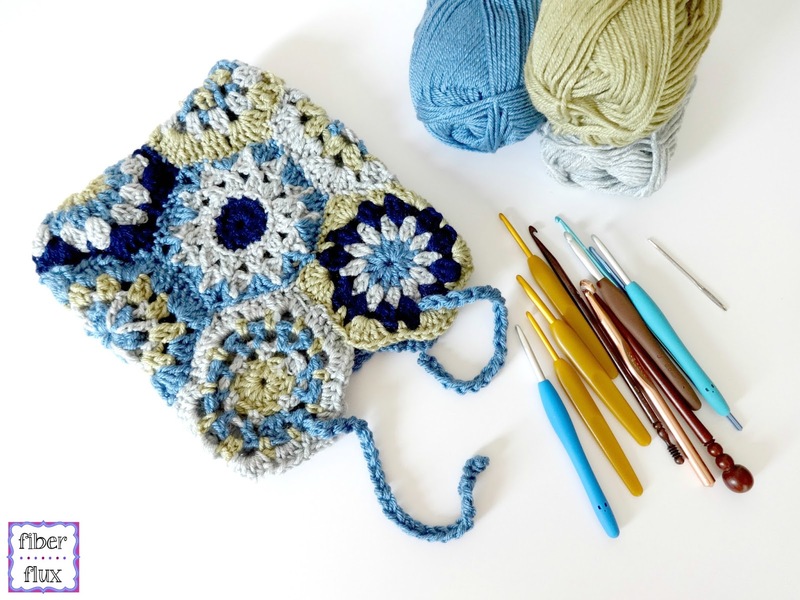 There's always a little time during the day to pick up your hook and crochet for a bit! 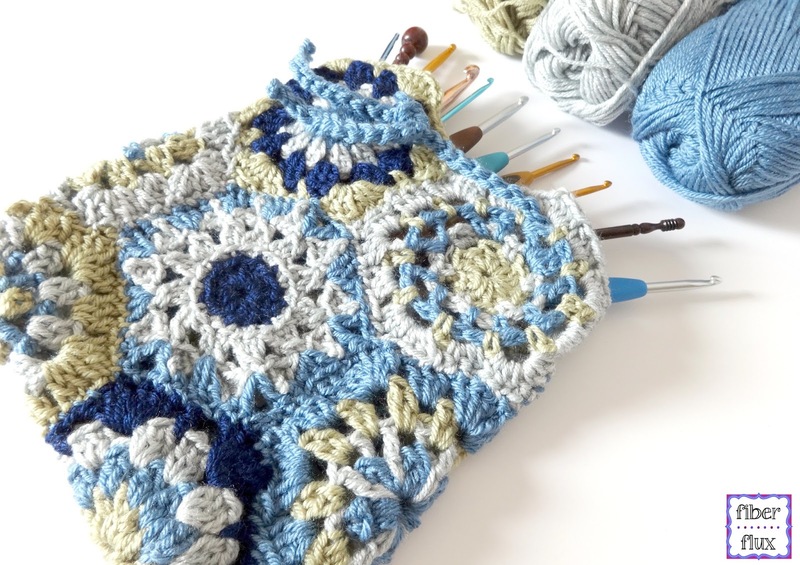 This pretty project bag is one of many projects from our Hexagon Crochet Along (CAL)...have you joined in on the fun yet? We're sharing all of our projects today...be sure to scroll down for links to each one. Now let's make a bag, shall we? Knit Picks Brava Worsted (Colors pictured: “Fig” “Dove Heather” "Solstice" and “Denim”) Note: Any worsted weight yarn will work for this project. For each hexagon you make the hook size will vary, just be sure your hexagons are about 5 inches across. A very special thank you to Knit Picks for supplying yarn for this project! Again, you'll need 10 hexagons, each about 5 inches across. 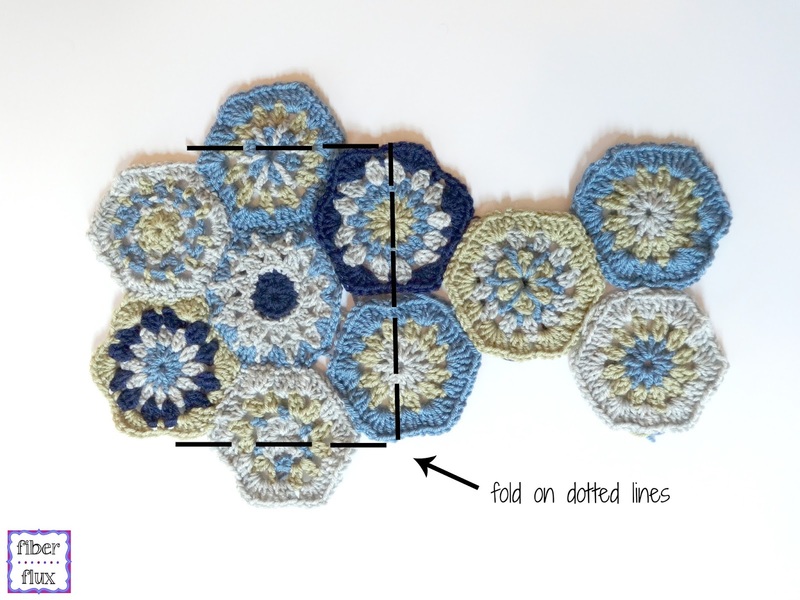 Arrange the hexagons as shown in the photo below and seam them together with a tapestry needle and matching piece of yarn. I used the super easy whip stitch as my seaming method. Tip: When you make each hexagon, leave a long tail at the end. 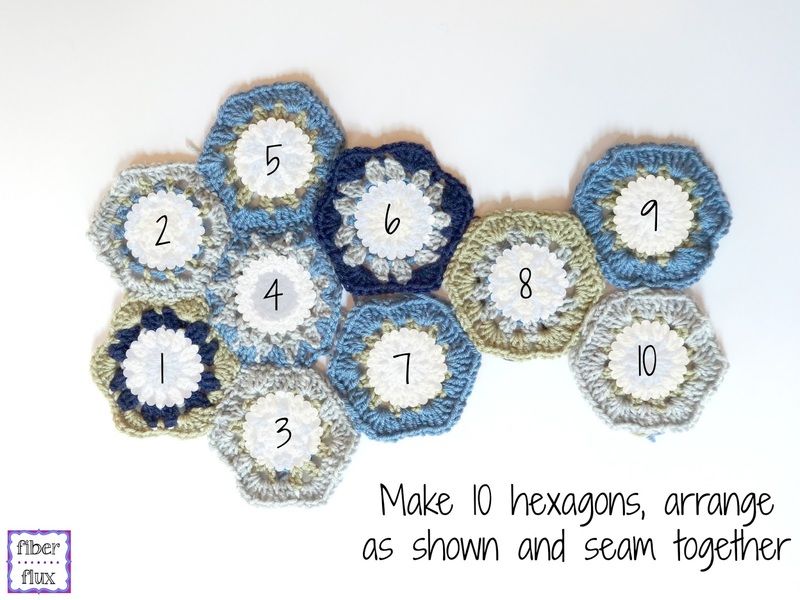 You can use the tails to sew the hexagons together. Important note: when seaming, be sure all hexagons are facing the same way (all right sides facing you, all wrong/back sides on the other side). 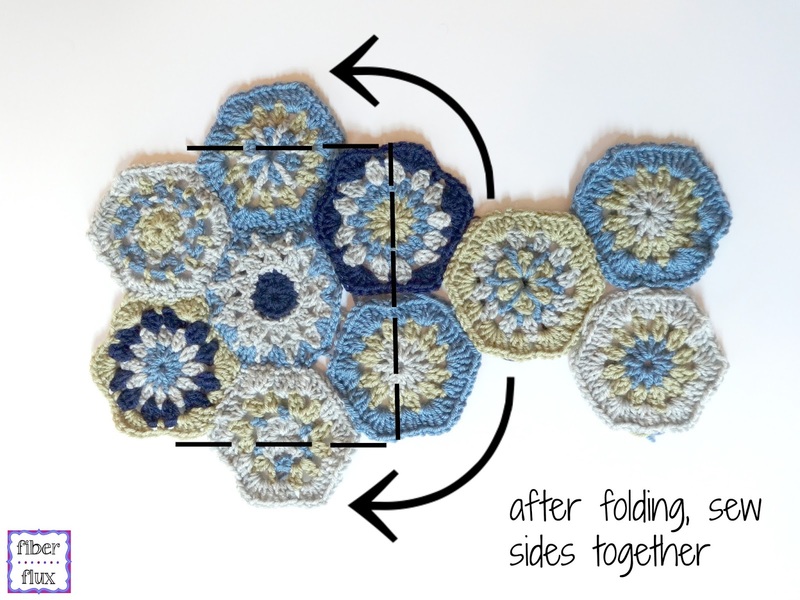 Once hexagons are seamed together, fold as shown below. After folding, seam sides together. Be sure bag is inside out (backs of hexagons facing outward). I used the whip stitch for this as well. To make the drawstring, hold two pieces of the same yarn together (I used two of the lighter blue) and make a chain about 22 inches long. Fasten off and weave in any ends that remain on the bag and drawstring. Thread the drawstring through the decorative holes from the hexagons at the top of the bag and tie closed. All finished...lovely! Is there a 'print friendly' button for this pattern?